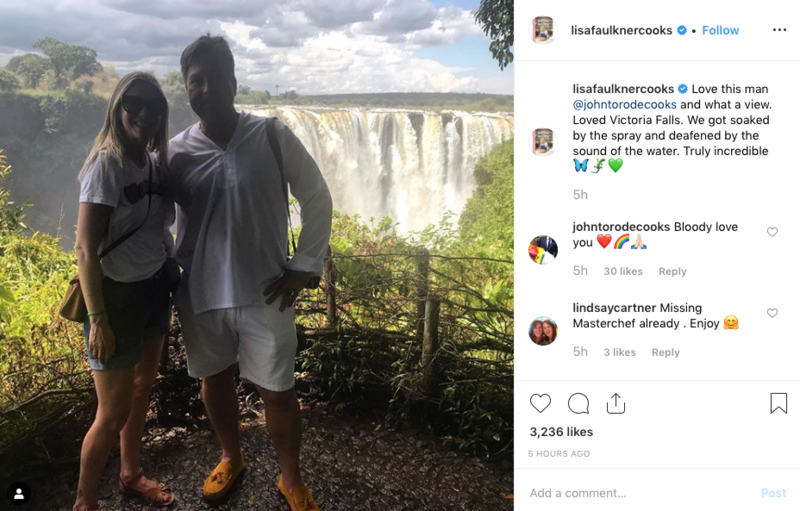 Former Holby City actress Lisa Faulkner, and her husband-to-be John Torode, have been exploring the beautiful country of Zambia, following a busy few months filming their brand new cooking show, John and Lisa's Weekend Kitchen. After bringing a brand new show to life and announcing an engagement, it’s no surprise the couple wanted some downtime, and judging by Lisa’s recent Instagram updates, the pair are having a fantastic adventure in South Africa! Her most recent update is a photo of the couple in front of the picturesque Victoria Falls. In the caption of the photo, Lisa shared a sweet message for her future husband, revealing how much she loved him. She wrote, ‘Love this man @johntorodecooks and what a view. Loved Victoria Falls. We got soaked by the spray and deafened by the sound of the water. Truly incredible 🦋🦎💚’. Adorably, John himself seemed equally keen to share his love for his future wife, commenting a sweet message on the image. He wrote, ‘Bloody love you ❤️🌈🙏🏻’ So cute! Despite being sprayed by water, it’s clear from their smiling faces that they’re enjoying every minute of the trip. With so much more of the country to explore, we’re sure the couple will continue to update us with more enviable holiday snaps before they jet back home again. Despite getting engaged a few months ago, it seems Lisa is in no rush to start walking down the aisle, after putting wedding plans on hold in order for work engagements. She’s teased that once Easter is out the way though, the planning will begin, and we’re excited to see the big day! When asked about working with Lisa recently, John revealed that the couple get on equally as well behind the camera as they do on camera.